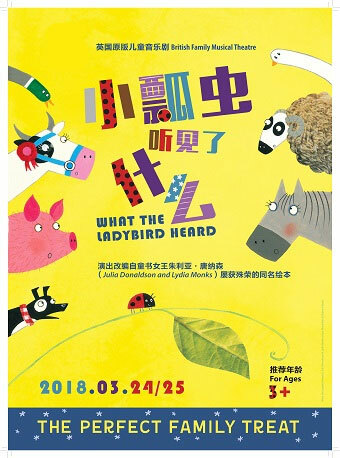 Musical: What the Ladybird Heard in Beijing will be held at Da Yin Theatre from Mar.23 to Mar.25, 2018. Two crafty robbers, one tiny ladybird, and a whole farmyard of fun! Hefty Hugh and Lanky Len have a cunning plan to steal the farmer's fine prize cow. But they reckon without the tiniest, quietest creature of all: The Ladybird has a plan of her own! Join the woolly sheep, the hairy hog, the fat red hen and the dainty dog in this brand new stage adaptation of Julia Donaldson & Lydia Monks' colourful farmyard adventure. With live music, puppetry, plenty of audience participation and lots of laughs! A glittering treat for all the family. What the Ladybird Heard is one of these fine gems. The story is simple but clever: The farmyard is full of noisy fun animals: MOO! HISS! BAAA! CLUCK!... and a quiet ladybird, who never said a word. But when two crafty robbers, Hefty Hugh and Lanky Len hatch a cunning plan to steal the fine prize cow, it is this quietest, tiniest creature of all who saves the day. The Ladybird has a plan of her own! Based on the award-winning picture book by the queen of children's stories, Julia Donaldson - the author of Gruffalo, Room on the Broom, Tiddler, Stickman, The Smartest Giant in Town, Monkey Puzzle and many more works - this London West End musical adaptation magically turns a simple, much-loved 5-minute bedtime story into a full hour-long production without intermission. Plenty of live music, dancing, puppetry, audience participation, catchy songs and lots of laughs! The show featured everything a kid could possibly want from life. Join the wooly sheep, the hairy hog, the fat red hen, the dainty dog, the goose, the horse and of course the duck in the pond! This colourful farmyard adventure will surely engage you and your child into a fun and educational theatrical experience. The performance in English with music.